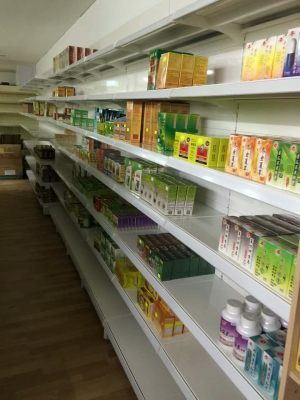 For most pharmacies, the store space is small, yet they have to shelve a wide range of pharmaceutical products within a limited space. Furthermore, most pharmaceutical products are of small packaging, each may come in different size and type. 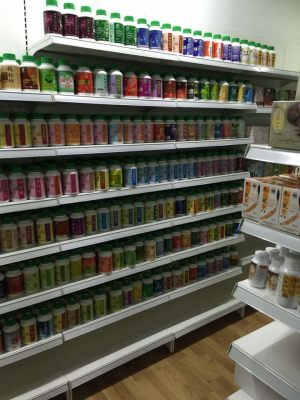 Therefore, without the right shelving design, it can be a real challenge organising pharmaceutical items. 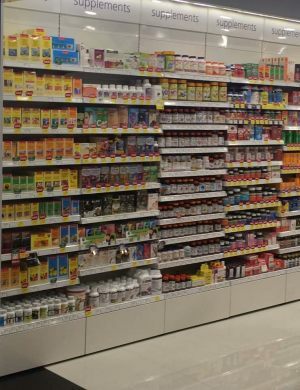 Furthermore, most consumers walk into a pharmacy with specific products in mind to buy. 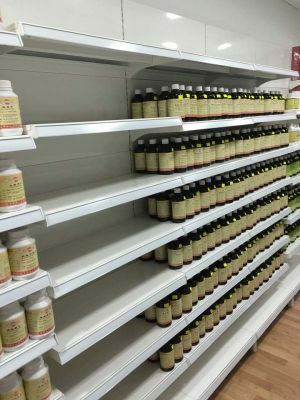 With the pharmacy shop retailing tablets, cough mixtures, vitamins and even body skin care lotions, shampoos and toiletries, the pharmaceutical store shelving becomes critical for the success of retailing. 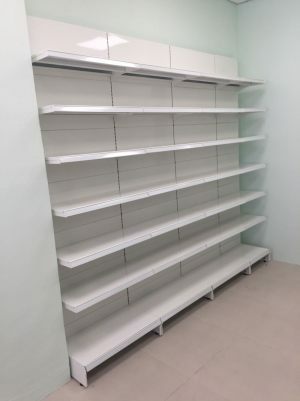 Since year 2000, Austinco has been supplying pharmacy store shelving in Singapore. 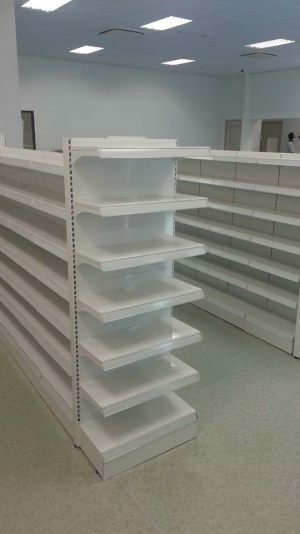 Today, major pharmacies such as Unity and National Healthcare Group pharmacy stores adopt Austinco's pharmaceutical shelving. 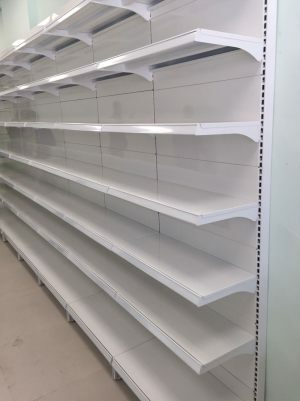 Shelving can be easily configured to match individual store space. 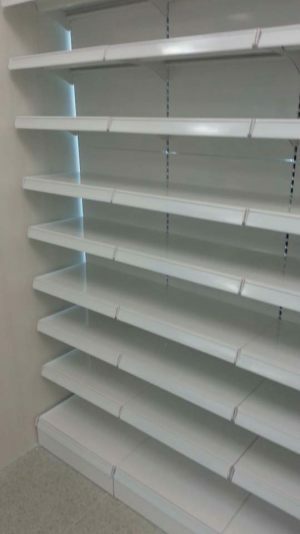 Shelves are easy to reconfigure without tools. Safe even under full load. 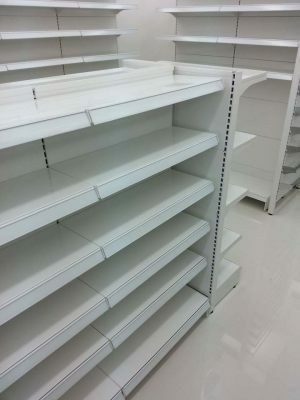 Shelve are optimised for easy stock replenishment, save manpower time and cost. 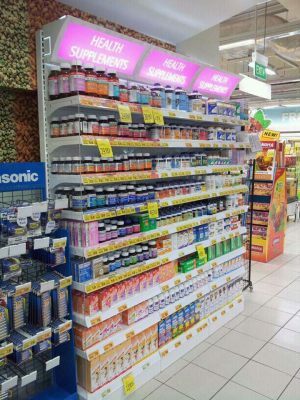 Lighting can be fitted under shelf to enhance product display. Flexible options for putting up creative in-store visuals such as marketing posters, brochures, hangs, standees, clips etc. Additional racks and backets can be attached at both ends of the gondola to extend product display. Shelving can be wall-mounted or self-standing as an island gondola. 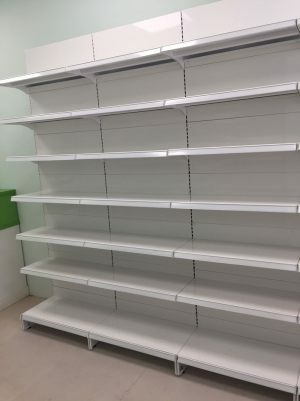 Contact Austinco to find out more about our unique shelving products for pharmacies.